Crimson Monkey Flower is a member of the Snapdragon (or Figwort) Family. It grows to 3 feet in height and has dark green oblong leaves with coarse teeth along the edges which grow to 4 inches in length. It can be found growing in wet areas such as near seeps, springs and in wet canyons at elevations between 1800 and 8000 feet. There are 14 different species of Monkey Flower which grow in Arizona. 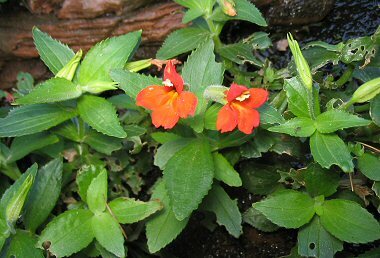 Crimson Monkey Flower blooms between March and October and produces a red to reddish orange snapdragon-like flower to 2 inches in length.